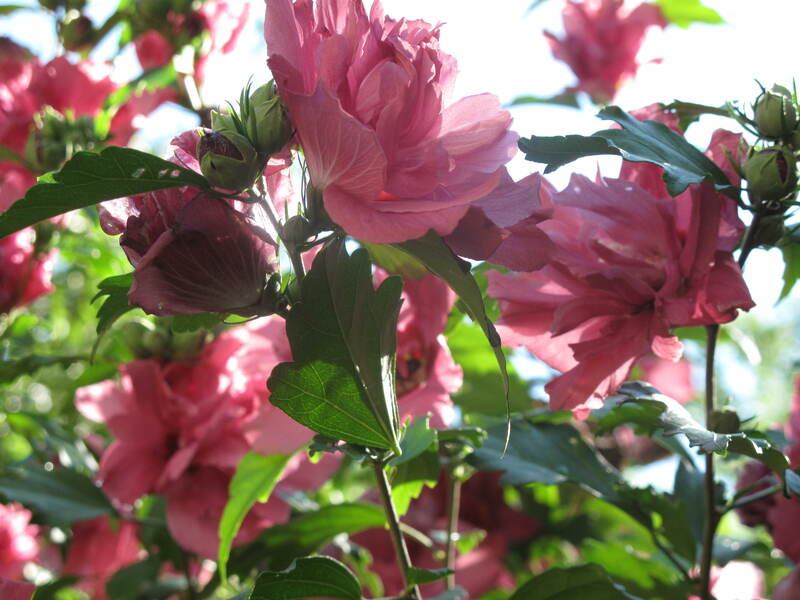 This is our Rose of Sharon shrub, otherwise known as Hibiscus syriacus. Given that the shrub is over 10 feet tall, it is on the mature side and has been in the backyard garden since we moved to Glen Road. The shrub itself is actually four shrubs that grow together to appear as one shrub. Our little optical illusion. In the Winter, you can see all four individual shrubs, but in the Summer they appear as one. 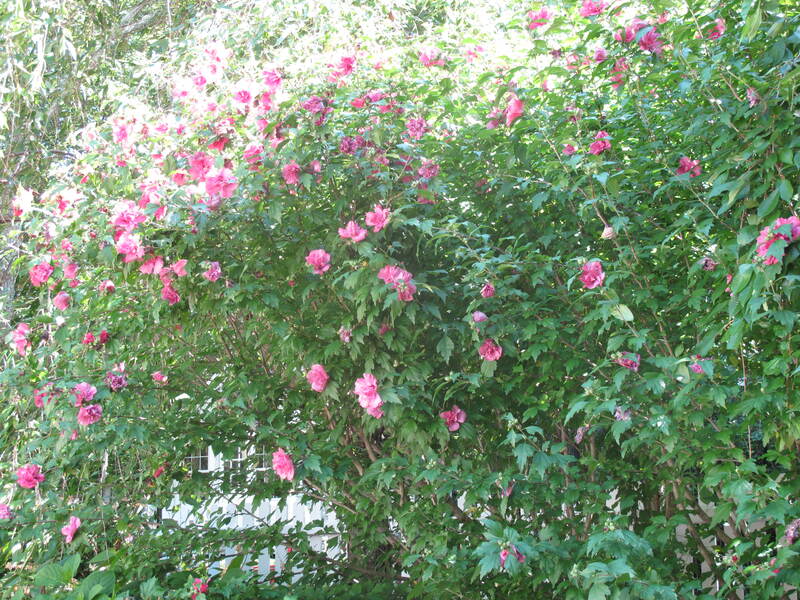 The two shrubs in the front of the cluster are the traditional pink Rose of Sharon variety. 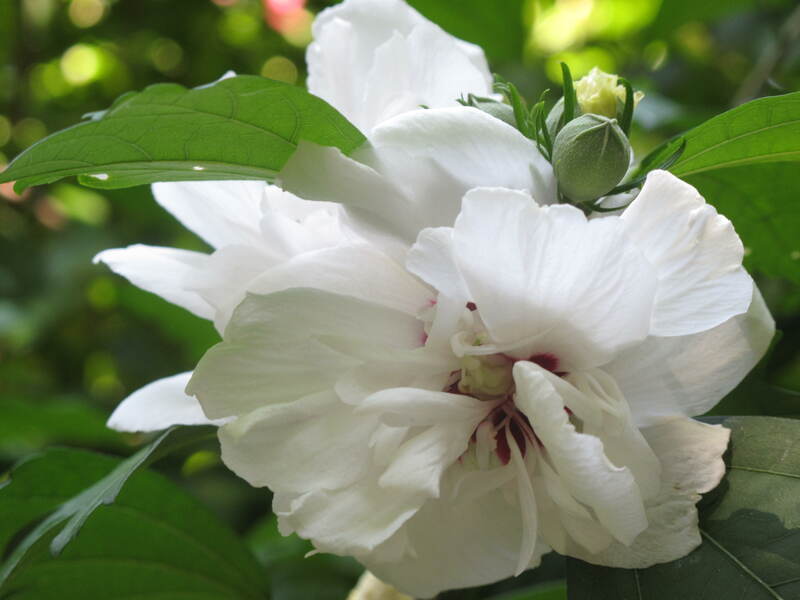 The two shrubs in the back of the cluster are actually Rose of Sharon in a white variety. 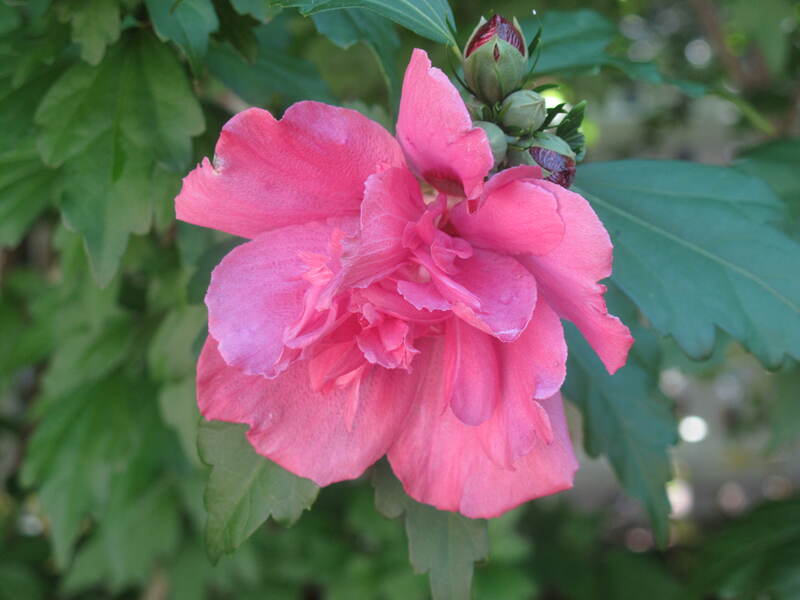 The value of a Rose of Sharon shrub is its late-summer bloom, usually beginning around the start of August. 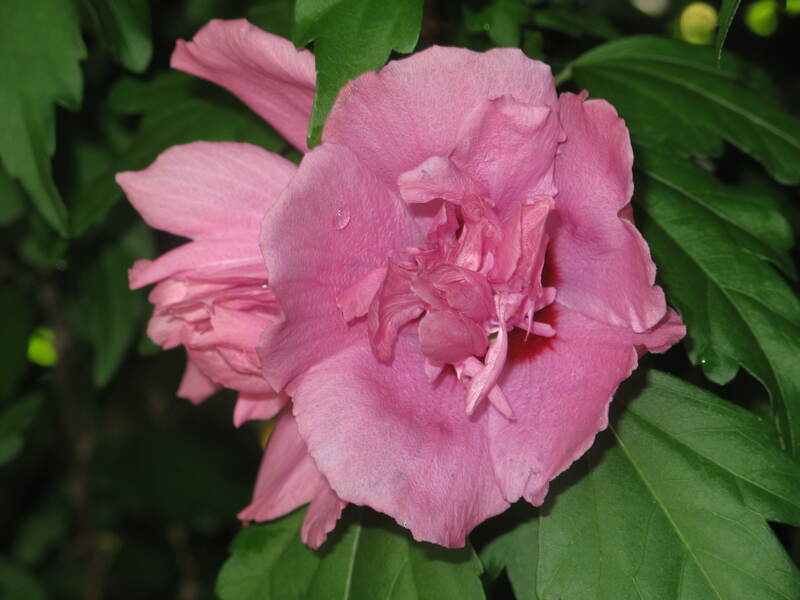 The Rose of Sharon is not a true rose and doesn’t grow like one. There are a number of varieties in shades of pink, purple, blue, lavender, red and white. The flowers are usually 3 to 5 inches in diameter. 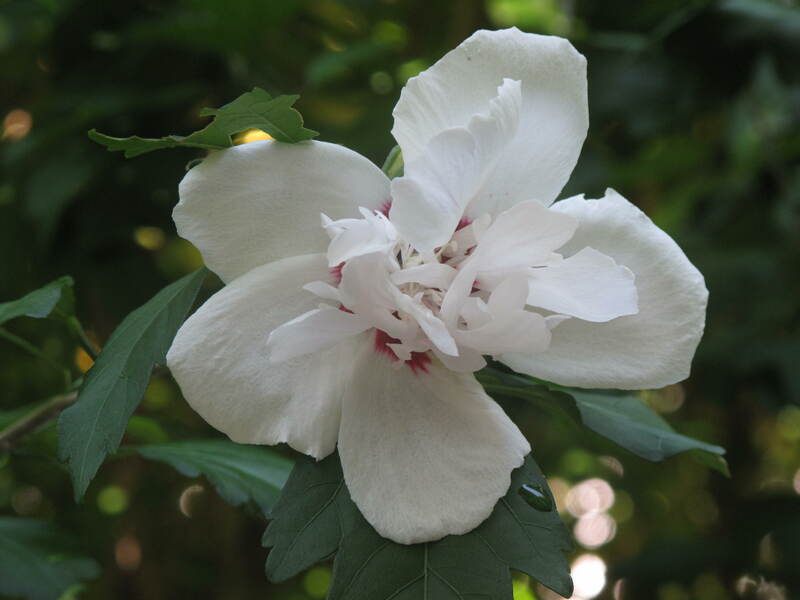 The Rose of Sharon is a tall, bushy plant reaching as high as 15 feet. Plants should be set in while still young and protected with mulch until they are well established. Until they are mature like the ones we have, you have to be careful as they are susceptible to winterkill. They grow in sun or part shade and they like moist, humusy soil with good drainage. Pruning need only be done if you prefer a smaller plant. You should cut back stems to laterals to control size and produce vigorous growth. Remove dead or damaged wood when discovered. Prune in the Winter in mild climates and in Spring in colder ones. We’re very happy to have such a late bloomer in our garden. We are a little surprised at how gorgeous the shrub has flowered given the hot temperatures it has had to live in over the last few weeks. I have read that the Rose of Sharon is guaranteed to attract a hummingbird to come and feed on its blooms, but so far we have not seen any. 😦 Lots of bees feeding on it, but no hummingbirds. What’s blooming now in your neck of the woods? This entry was posted in Gardening, Life, Nature and tagged Acorns, Beauty, Blog, Fun, Gardening, Life, Lifestyle, Love, My Life, Nature, Photos, Recipes, Thoughts. Bookmark the permalink. pretty flowers…… i like it! Thanks for your comment Regina. Welcome to Acorns On Glen. Come back and visit soon. We are always showing blooming flowers from the garden. Our tree roses are blooming again which was a pleasant surprise. The flower you just showed is beautiful. How long can you enjoy the blooming (short or a long blooming period)? Thanks for the comment Carolkin. The blooming last all the way through August which is nice. Not much blooms in the late hot Summer. Come back and visit us soon. You have such a great garden! Thank you so much for your comment. It’s a lot of work, but worth it when something blooms and is so beautiful. Come back and visit us soon. Having flowers to brighten the yard is such a pleasure! Hi and thanks for the comment. Couldn’t agree more. Lots of work, but worth it.